How do children today learn to understand stories? Why do they respond so enthusiastically to home video games and to a myth like Teenage Mutant Ninja Turtles? And how are such fads related to multinational media mergers and the "new world order"? In assessing these questions, Marsha Kinder provides a brilliant new perspective on modern media. 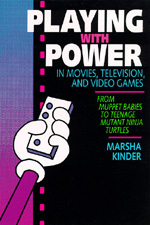 Marsha Kinder is Professor of Critical Studies in the University of Southern California School of Cinema-Television. She is the author of Blood Cinema (California 1993).